TMK in Trans-Mars injection manoeuvre. Russian manned Mars flyby. Study 1959. In 1959 a group of enthusiasts in OKB-1 Section 3 under the management of G U Maksimov started engineering design of this first fantastic project for manned interplanetary travel. AKA: Heavy Piloted Interplanetary Spacecraft. Status: Study 1959. Gross mass: 75,000 kg (165,000 lb). Specific impulse: 350 s. Height: 12.00 m (39.00 ft). Span: 12.00 m (39.00 ft). The 75 metric ton TMK-1 spacecraft would take a crew of three on a Mars flyby mission. After a 10.5 month flight the crew would race past Mars, dropping remote controlled landers, and then be flung into an earth-return trajectory. The first flight to Mars of the TMK-1 was planned to begin on June 8, 1971, with the crew returning to the earth on July 10, 1974, after a voyage of three years, one month, and two days. There seemed no prospect of the gigantic MPK Mars expedition project being approved or accomplished within a reasonable time span. So a more realistic initial Mars or Venus flyby mission became the basis of the next study. The concept was for a manned spacecraft, the 'Heavy Piloted Interplanetary Spacecraft (TMK, retrospectively called TMK-1), to be launched by a single N1. The requirements for executing this project would shape the specifications for the N1 launch vehicle. One reason the Soviet Union did not beat America in the moon race was that the N1 was sized to launch the TMK-1 rather than a direct-landing moon mission. The three-crew TMK-1 would be placed in near-earth orbit by one launch of the N1. There were two variants of the next mission phase. In the first, the TMK-1 was launched manned. 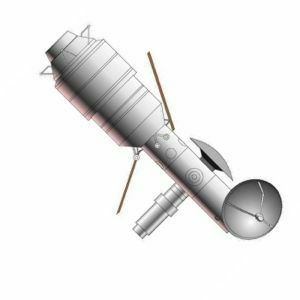 In the second variant, the TMK-1 would be launched unmanned, then the crew would be launched in a Sever or Soyuz spacecraft, dock with the TMK-1, and transfer to the Mars craft. A liquid oxygen / kerosene trans-Mars injection stage would boost it on its long trip towards Mars. After burnout of the rocket stage, the total initial mass of 75 metric tons was reduced to 30 metric tons. After 10.5 months it would fly by Mars, dropping remote controlled landers, and then be flung by the gravity of Mars into an earth-return trajectory. Only minor midcourse maneuvers would be required. 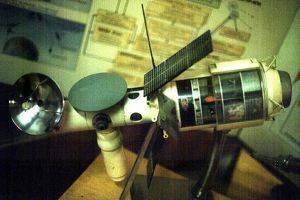 A variation of this scenario developed by Maksimov's group involved flybys of Venus on the return voyage, and was given the code name "Mavr" ('Moor' or MArs - VeneRa). During boost the crew re-entry capsule was mounted ahead of the pilot section. 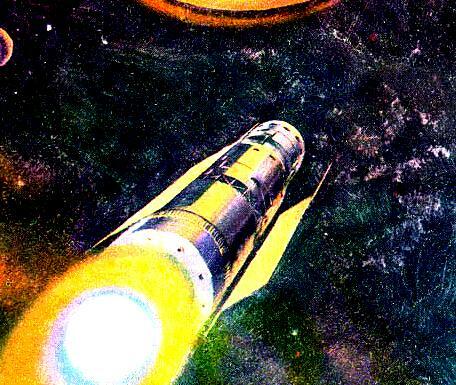 After beginning the coast to Mars, the crew section telescoped out from the protective shroud, the capsule was moved to the other end of the TMK by external mechanisms, the antennae and solar collectors unfurled, and the entire spacecraft began rotating around its center of mass to provide artificial gravity. The crew section had a mass of 15 metric tons, a diameter of 6 m, and a length of 12 m.
Habitation or pilot compartment, with an internal volume of 25 cubic meters. Work or equipment section, including the hatch for extra-vehicular activities and a solar storm shelter when solar flares brought the interplanetary radiation levels to dangers levels. Total volume of the section 25 cubic meters. Biological systems compartment, with the SOZh closed-cycle environmental control system, with a total volume of 75 cubic meters. The SA crew earth re-entry capsule, about 4 m in diameter, with the 'reverse Soyuz' configuration of the US Discoverer/Corona re-entry capsules. 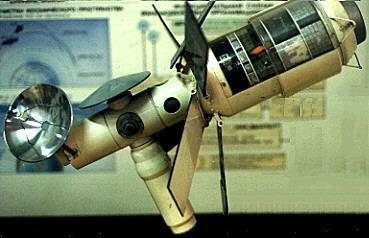 A critical item for the TMK-1 project was development of the SOZh closed-cycle environmental control system. The system used biological processes, assisted by some physical-chemical processes, to mimic the ecosystem of the earth. Blue-green algae were used to transform the crew's exhaled carbon dioxide back into oxygen and to provide near-complete recovery of water and body wastes. Water exhaled by the crew was recovered and run over ion exchange resins before being returned to the chlorophyll tanks. 20% to 50% of the crew's food would be grown in hydroponic greenhouses. How to accomplish all of this in the close confines of the TMK-1 was a major challenge. It would require the use of a large labyrinthine solar concentrator to provide intense sunshine in a limited area. The Institute of Medical-Biological Problems (IMBP) and the Zvezda design bureau (designer of the ejection seat, space suits, and environmental control system for the Vostok spacecraft) became partners with OKB-1 in developing the SOZh. An earth-based simulator - the Earth Experimental Complex (NEK, or SU-100) was built. V Ulibishev, G Manovtsev, and A Bozhko spent an entire year in this closed-environment test unit beginning on 5 March 1967. An analogous US experiment was conducted for only 90 days in July-September 1970. A special problem of interplanetary flight was protection of the crew from radiation from the solar wind and cosmic rays. Readings from unmanned satellites indicated that the normal cumulative radiation dose over a Mars mission would be within acceptable levels. But the crew would need special protection during periods of maximum solar activity. At such times they would take refuge in a radiation shelter. The shelter consisted of a shielded tunnel, equipped with a simplified spacecraft control station, located in the equipment module. Another biological problem of which nothing was known during the design of the TMK was the effect of prolonged weightlessness on the crew. Rotation of the TMK about its axis was studied as a means of producing artificial gravity, but the small diameter meant that coriolis forces would produce nausea and probably be worse for the crew than the weightlessness. It was decided that the TMK would be revolved only periodically during the flight to keep the crew adjusted to Earth gravity forces. To allow operation of the complex spacecraft with a limited crew, automatic devices monitored the operation of its systems. The status of each system was flagged on the main control panel as either 'Normal', 'Deviation from Normal' or 'Malfunction'. Cosmonauts could access and repair the craft's electronic and electric systems which were mounted on a light cantilever structure. The TMK-1 draft project was completed on 12 October 1961 and had involved nearly all sections of Korolev's OKB-1. Those who worked on the TMK included A I Dylnev, A K Algypov, A A Kochkin, A A Dashkov, V N Kubasov, V E Bugrov, and N N Protacov. Kubasov would be selected as a cosmonaut in 1966. Family: Mars Expeditions, Mars flyby. Country: Russia. Launch Vehicles: Mars tactical rocket, N1, N1 1969. Propellants: Lox/Kerosene. Agency: Korolev bureau. Bibliography: 193, 206, 376, 89. MAVR Mars-Venus flyby spacecraft. The original TMK was similar. 1959 During the Year - . Launch Vehicle: N1. TMK Heavy Piloted Interplanetary Spacecraft - . Nation: Russia. Spacecraft Bus: TMK. Spacecraft: TMK-1. In 1959 a group of enthusiasts in OKB-1 Section 3 under the management of G U Maksimov started engineering design of this first fantastic project for manned interplanetary travel. The requirements for executing this project would shape the specifications for the N1 launch vehicle. The TMK-1 would then be put on a free flight trajectory towards Mars. After 10.5 months it would fly by Mars, dropping remote controlled landers, and then be flung by the gravity of Mars into an earth-return trajectory. Only minor midcourse manoeuvres would be required. The first flight to Mars of the TMK-1 was planned to begin on June 8, 1971, with the crew returning in a re-entry capsule to the earth on July 10, 1974, after a voyage of three years, one month, and two days. A variation of this scenario involved flybys of Venus on the return voyage, and may have been the project given the code name 'Mavr' ('Moor' or MArs - VeneRa). 1961 October 12 - . Launch Vehicle: N1. TMK-1 draft project was completed. - . Nation: Russia. Related Persons: Korolev. Spacecraft Bus: TMK. Spacecraft: TMK-1. Design of the manned Mars flyby spacecraft had involved nearly all sections of Korolev's OKB-1. Those who worked on the TMK included A I Dylnev, A K Algypov, A A Kochkin, A A Dashkov, V N Kubasov, V E Bugrov, and N N Protacov. Kubasov would be selected as a cosmonaut in 1966. 1963 April 28 - . LV Family: N1. Launch Vehicle: N1 1964. N1 Plans - . Nation: Russia. Spacecraft: L3-1963, OS-1 (1965), TMK-1. An Inter-Institution Soviet considers Korolev's N1 plans. He believes the first booster will be launched in 1965. The N1 is to have a payload capability of 75 tonnes to a 250 km altitude orbit, 50 tonnes to a 3000 km altitude orbit, and 16 tonnes in geostationary orbit. It could launch spacecraft capable of landing men on the moon and returning them to earth, or manned flybys of Mars or Venus. Three to ten launches would be needed for such missions, with the components being docked together in low earth orbit. The N1 can also be used to launch a large space station for military research. After the N1 discussion a decision is made that cosmonauts will not have to spend more than three to four days in a spacecraft mock-up on the ground to prove their readiness for flight. A simulation of the entire flight duration is not necessary. 1967 March 5 - . Launch Vehicle: N1. Three Soviet subjects begin full year in closed-loop NEK Mars spacecraft simulator. - . Nation: Russia. Spacecraft Bus: TMK. Spacecraft: TMK-1. The Institute of Medical-Biological Problems (IMBP) and the Zvezda design bureau (designer of the ejection seat, space suits, and environmental control system for the Vostok spacecraft) became partners with OKB-1 in developing the SOZh closed-loop environemental control system. An earth-based simulator - the Earth Experimental Complex (NEK) was built. V Ulibishev, G Manovtsev, and A Bozhko spent an entire year in this closed-environment test unit beginning on 5 March 1967. An analogous US experiment was conducted for only 90 days in July-September 1970.